To create video tutorials and presentations, you need software to record on-screen activity so that you can edit and share with other people. Not only for presentations, but many learning videos on YouTube require these video capturing tools to capture what you do on the desktop screen, whether it is playing games, reviewing mobile phones, teaching lessons or anything. Camtasia Studio is one of the popular screen recording and video editing software which helps you quickly create professional videos with high-quality and share them with anyone without any mere training. The program is flexible, user-friendly and works smoothly compared to other screen recording programs out there. Camtasia Studio 8.1 also has the ability to capture PowerPoint slides, add imported media, edit videos, and share them easily. The main intention of developing Camtasia Studio is to create quality videos that can train audience, illuminate an idea, share knowledge, or offer feedback. The program allows you to create interactive videos with multiple video and audio tracks, an extensive asset library, and to animate content. The latest version 8.1 has improved quizzing, multi-track timeline, enhanced asset library, animate callouts, improved screen recording technology, and has added Chrome key. 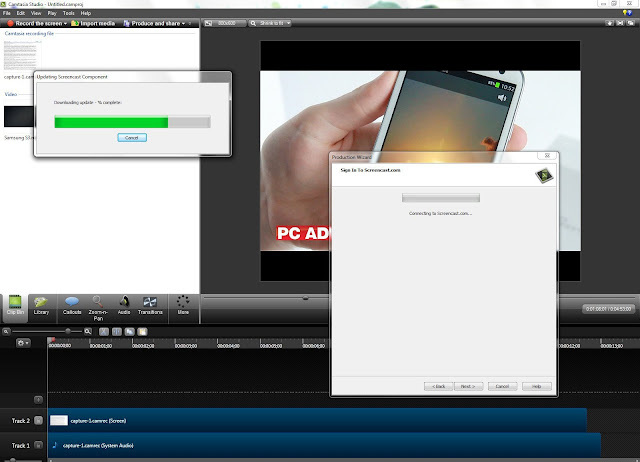 Camtasia Studio contains a huge set of output formats and has support for YouTube and HD Video. It offers a preview feature to view the sample before completing the whole process. Camtasia Studio 8.1 is free to try for 30 days or can be purchased for $300. The price is quite expensive as well as surprising, but this screencasting software has got high potential in doing serious business. Both inexperienced and professional users should be able to learn the software. Capture smooth, high-quality videos with world-class screen recording technology. Import HD media and personalize your videos. Unleash your creativity with Multi-track Timeline that helps you to create videos faster with unlimited number video and audio tracks. Create polished videos with Media Asset Library, which include a wide range of new callouts and media themes. Engage your viewers with stunning visual effects via ‘SmartFocus’ feature and animated content. Share your videos with anyone, anywhere with TechSmith Smart Player. Produce the precise video you wish to via Production Wizard feature. Send created videos directly to YouTube or Screencast.com; Share them via email, tweet, blog post, and more. Can be used in Teaching, Training, and Business fields. Firstly, Camtasia Studio provides a dedicated tool to record images from your screen. You can customize your recording settings using Camtasia Recorder such as recording whole screen or a portion of it, recording audio as well, adding cursor effects, taking webcam images, etc. Secondly, if offers various editing tools to personalize your video like adding more information with on-screen text captions, applying transition effects, etc. The Clip Bin and the Library will ease the task of choosing media files to use in your video. You can adjust volume, reduce noise, and optimize voice with the Audio Editor. The third and final stage is the production stage where the “Production Wizard” which makes it easy for you to choose required video presets such as codec, resolution, size, and other details, and will finally render your video. You can export the produced videos directly from Camtasia Studio program to YouTube. Summing up all, Camtasia Studio 8.1 is one of the best video capturing software available today with complete features, which can export videos to any sort of device or system such as Web, mobile phones, tablets, DVDs, and other devices. The online help center is very helpful in learning on how to use professional videos with the application. Download Camtasia Studio 8.1 30-day free trial first and then go purchasing it. It is supported in Windows 7, Vista, XP, and Mac OS.